Pet owners are lucky to have pets and enjoy a good quality of life. They know that how their lovely companions improve their life while helping them to move out of stress and other painful conditions. Moreover, women can gain benefits of pet ownership, as it help them to stay healthy, lower anxiety levels and decrease the risk of strokes. This woman’s day let us have a look at 8 health benefits of owing a pet. If you don’t have any try to own at least one pet and enjoy the most beautiful you with your furry friend. Living with a pet, dramatically reduces stress and help you stay healthy. According to a research, when people are given stressful tasks, they undergo less stress when their pets are around them compared to their spouse or friend being nearby. Psychologists advise women, who work under stressful conditions like editors, to have a pet. This greatly helps them to cope with stress and reduce tension. Especially women, who are single, face lots of stress and loneliness. 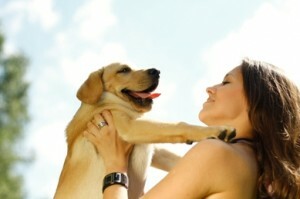 Owing a dog or cat, they can lead a stress-free and happy life. Some women experience pain at different stages of life like during menstruation, after pregnancy or post-operation. Indulging with pets help reduce pain during such periods. They can even be the best medicine when people are undergoing constant chronic pain such as migraines or arthritis. Survey states – ‘Having a pet reduces anxiety, less anxiety means less pain’. Pet therapy also supports people to recover faster post-surgery and needs less pain medication than those who do not. There are many health benefits of owing a pet. They keep up your mental and emotional health. People who are having pets are always happy and in good mood. They become less irritated and are mostly optimistic about life. Psychiatrists use pet dogs and cats in various therapies as they help improve patient’s moods and conditions. They are also helpful for people facing post-traumatic stress. Dealing with day-to-day stress, people suffer from high blood pressure. There are also several other reasons that cause hypertension in people, especially women are more prone to it. Owing a pet, remarkably reduces the possibility of getting this most common and dreadful disease. Moreover, having a pet as a companion lowers blood pressure and helps to lead a normal life. Severe strokes can cause dead. To decrease the chances become a pet owner. Pets greatly decrease chances of getting strokes. People consider dogs as best companion to reduce stress but cats too are not exceptional, as they are more helpful in fighting strokes. People are 30 per cent less likely to get heart attack, when they have cats as their companion. A research at a heart institute shows that owing a pet lowers cholesterol and triglyceride levels compared to people, who don’t have pets. Additionally, pet owners usually lead a healthy lifestyle and keep most the diseases at bay. With pets around, you significantly improve immunity, which further prevents allergies. Living with pets from an earlier age help you develop fewer allergies. Additionally, in children, it helps prevent developing certain allergies. Pets are the best companion at old age. Being alone at old age, women face lot of problems. Special trained dogs help older people in numerous activities. Whether reminding them to take medicine, getting them newspaper or going for a walk, pets help them greatly, and even take care of them. These are just a few benefits that you can gain owing a pet. In our next edition, we will share some more health benefits of owing a pet, until then stay tuned!